Remember to add your neighbors in need to your holiday gift list. When sitting down to eat a delicious Thanksgiving dinner with friends and family, in addition to expressing thanks, take a few minutes to reflect on sharing your bounty with those in need. Some of your neighbors went to the local food pantry instead of the grocery store to gather ingredients for their dinner. Maybe your family filled a bag for the food bank when you did your holiday shopping. The staff at regional nonprofit Hopelink reports many companies and individuals were extraordinarily generous this holiday season. Unfortunately, that generosity is greatly needed, despite years of vibrant economic growth in the Pacific Northwest. While unemployment has dropped dramatically over the past five years, poverty and homelessness have grown in King and Snohomish counties. In 2017, Hopelink provided more than 2 million meals to 13,740 individuals and families. 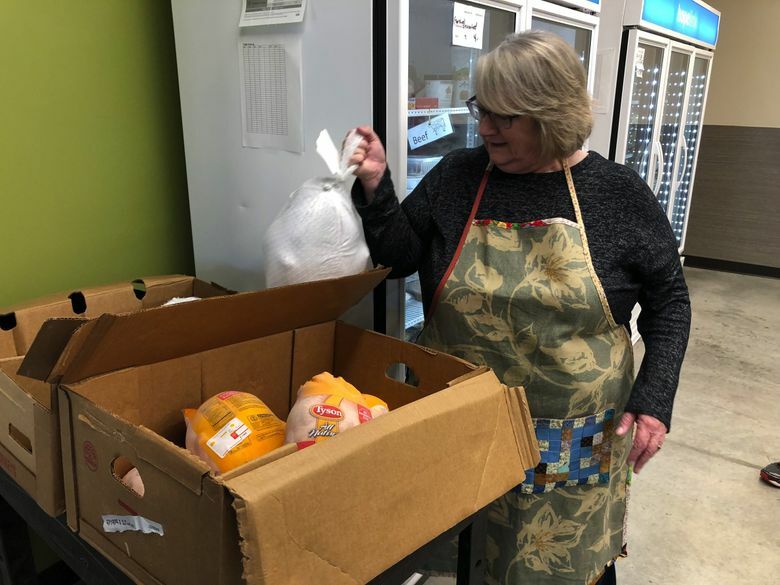 Every week, hundreds of families visit the agency’s food pantries around Puget Sound to pick up essentials like fresh fruit and vegetables, frozen and canned meat and fish, bread, cereal and rice. Thanksgiving fare is more of the same, plus boxes full of sweet potatoes and 2,800 donated turkeys. Eighty percent of the food on the shelves of a Hopelink food pantry, which looks more like a small grocery where clients walk around and fill their carts, is donated by companies and individuals. The rest is purchased through donations to Hopelink, Food Lifeline and The Seattle Times Fund For The Needy. Buying or cooking enough turkey, stuffing, potatoes, cranberries, rolls and pumpkin pie to feed 10 people plus some leftovers cost an average of $48.90 this year, according to the American Farm Bureau Federation. Let that number be the inspiration for a donation to a local food bank or the Fund For The Needy. Write the check before leaving for the mall for Black Friday shopping. Another way to add meaning to your holiday celebration would be to invite your children or grandchildren to pick out a toy for a child in need. Hopelink opens a holiday boutique in December, where parents and grandparents can choose gifts for the children in their lives. And the need for food donations continues. While planning a holiday baking session, consider donating a bag of baking ingredients — vegetable oil, flour, sugar and chocolate chips — which are all rarities among food donations dominated by canned green beans and chicken noodle soup. Remember to add your neighbors in need to your gift list this holiday season. Sharing your bounty will help put you in a holiday spirit.